Lighter winds than forecast allowed Race Officer Duncan Adams to set a testing course that enabled the competitors to visit almost all of our marker buoys. 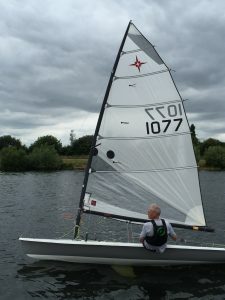 Race 1 was led away by Kevin Milton in his Phantom but Kevin Last slowly reeled him in to finish within a minute and of the Phantom and win on handicap. Rob Corner in his Supernova had a great battle with Kevin Last finishing seven seconds behind and coming second overall. The second race was similar with the two Kevins at the front with Last winning again and Milton second overall. Bob Cuerstemont had a stunning second lap to move clear of the Supernovas of Andrew Goodman and Rob Corner to take third overall. Weather is looking better for next weekend so hopefully we will have a few more on the water.